The earlier Prof blog entries as well as some new articles are now available as a Kindle book from Amazon. We hope you enjoy it. A Neologism is a 'new word' (that's what Neologism means in Greek). They pop up all the time, because as the world changes we need new vocabulary to describe it. Usually something new comes along – for example a telephone or a squeegee - and the human race comes up with a word for it. Occasionally though, we get the word first and the actual thing comes along later. This happens particularly with science fiction, because it is the job of sci-fi writers to imagine a new world. Often the words that these writers invent become part of our language, or part of the specialist engineering or scientific field where these inventions come to life. For example, engineers and others often use 'waldos' when they are nowhere near where a job that has to be done. But put your hands into special gloves, and through the internet you can operate a pair of robot hands which do the actual work. The waldos were first described in 1940 by writer Robert Heinlein, long before the internet was ever operational. Even more remarkable are the 'robot' hands, since 'robot' was first used in a 1920 play called 'Rossum's Universal Robots' by Czech writer Karel Capek. Given that science fiction is often about space, we should not be surprised when 'spaceships' (term invented in 1894 by writer J.J. Astor) 'blast off' (a term made popular by 1930s sci-fi writers). No doubt 'tractor beams' and 'death rays' will move from fantasy to reality when science catches up with the existing vocabulary. Other words such as 'android', 'cyberspace' and 'hive mind' all owe their existence to the active imaginations of science fiction writers. My favourite such word was inspired by a boy's action hero of a century ago. His name was Tom Swift, and his fondness for gadgets inspired, among others, Steve Wozniak co-inventor of the Apple computer. Tom Swift's full name was Thomas A. Swift and one of his favourite weapons was an 'electric rifle'. This inspired the modern stun gun called 'Thomas A. Swift's Electric Rifle', or TASER for short. Government departments and large organizations have been doing this for years. Statements that 'Apologise for the inconvenience' usually have an unheard snigger attached. It's the corporate equivalent of 'sowwy', (usually said in a childish voice) by which an English person signals that he is actually not sorry at all. The most recent addition to this genre is the 'We are sorry that people were offended by ...'. The beauty of this is that it sounds like an apology but it is not. The statement does not apologise for giving offence, and indeed does not even admit to being offensive. All is that is stated is regret that some people were offended, with a sub-text that some people will get offended by anything. Of course one can also go the full Churchill. When Winston was ordered by the speaker to apologise for insulting another member of parliament, he replied, 'It is claimed that I called the honourable member an idiot it is true and I am sorry.' He then sat down, adding that the honourable member could punctuate that sentence as he pleased. Language changes. In most cases it doesn't have to, because no-one thinks that Shakespeare was not capable of expressing himself perfectly well. However, there's a lot of Shakespearean language that we don't use today, (fardels, bodkins and so on). Sometimes that's to do so with changing circumstances, but just as often it is to do with fashion. In an age when neologisms are popping up all the time, we should really start digging up some of the great words that we unaccountably abandoned a few centuries back. Go coddiwompling through a comprehensive dictionary, and you'll see what I mean. One of the joys of working with English is that there's always something new to discover about the language. Recently I was discussing the use of the word 'factoid' which the BBC was using (perhaps more accurately than intended) to give extra details about a story. The thing about words ending with '-oid' is that they resemble the thing described by the first part of the word, but they are not the same. So an 'asteroid' is a bright light in the sky, but it is not a star ('aster' in Latin). A planetoid is not a planet, and moving down to Earthly examples, opioids have the effect of opium, but are not opium. Your thyroid looks like a small version of an ancient Greek shield called a 'Thryus', but it isn't. Likewise factoids are not facts. The word was coined by an American writer to describe things reported in the media that have been repeated so often that everyone believes them to be facts although they are not. Since the misuse of the word 'factoid' as 'an item of interesting trivia' was coined by the media, this second definition of 'factoid' is itself a factoid, which is deliciously recursive. Once you get into it, it's rather fun finding out where '-oid' words come from. The ending itself comes from Greek 'oiedes' -'shape' or 'likeness'. So, for example, when a medical researcher came upon a substance in the body that resembled (but wasn't) sterol - the stuff that makes up cholesterol – the obvious name was 'steroid'. And so on. And those droids you were looking for? Well, the Greek for 'man' is 'andros'. So a robot that looks like a man is an 'android'. The short form of android is 'droid'. QED, or should I say C-3PO? 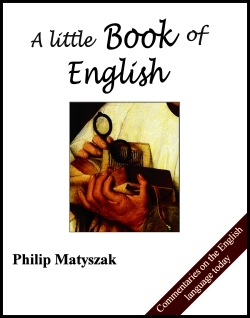 English has always been just one of the languages spoken in the United States. Apart from the many different languages spoken by the native peoples, every group of immigrants has brought their own language to the country. Sometimes, places which were not English-speaking such as Louisiana and New Mexico became part of the English-speaking United States as that country swallowed up much of the North American landmass. In the 1910 census, there were 92 million Americans. Three million spoke German, half that number spoke Italian, and Polish, Yiddish, Spanish and over a dozen other languages had between a hundred thousand and half a million native speakers. Yet a recent survey of the descendants of these Americans revealed that almost without exception, their first language, and usually their only language, was English. Basically, research has shown that the United States is where languages come to die. It has been shown that many immigrant Americans hyphenate themselves (Korean-American, Italian-American, and so on) for around three or four generations. However, by then they have lost their original language. The reason is simple enough – the social and economic opportunities available to immigrants improve in direct proportion to their English ability. Therefore the parents tend to acquire English rapidly, and their American-born children start off with it. This is especially true in linguistically mixed marriages. It has been shown, for example, that in marriages between an English and a Spanish speaker in the USA, less than 2% of the children had Spanish as a first language. This is not necessarily as good thing. Language diversity is worth hanging on to. Not only has US English been greatly enhanced my bleed-over from other languages (especially Italian and Yiddish) but it has been shown time and again that bilingual people have more flexible thought processes and a greater capacity to absorb new ideas. The problem is that it is hard to convince the US-born children of immigrants of this. If you are the only kid in the playground who speaks Farsi, then there's a temptation to ditch the Farsi and concentrate of blending in with English, no matter how it outrages your parents.